Want to Save Shipping Cost? Just choose whatever you want and ask us Container Shipping with BIS! Container shipping is the most secure and efficient way to save shipping cost. Just choose whatever you want on Autowini and ask our staff to handle all those items on behalf of you. We will gather all the items you need and into CY and ship them safely into container. All the transaction will go through BIS service! And you will get full customer support throughout the deal! Do not worry but relax. Ask Autowini with multiple items. · Check the item’s availability & information. · Get final price from sellers. · Quote entire shipping cost to your port. Confirm to purchase & send money. 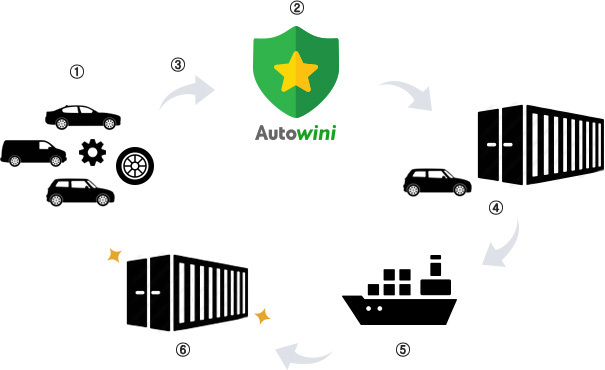 Autowini gather all the items each seller’s ship them safely into container. Get the container in your port finally! Container shipping is usually 20%-30% cheaper than Ro Ro shipping. We will work for you as your agent here from money handling, shipping arrangement, document handling and even the verification of information! Autowini will find out the best price from each suppliers.